SharePoint Landing Page for Links - a tutorial from kalmstrom.com. In SharePoint 2013 only three links are shown on the default view pages. Additional links are hidden beneath an ellipsis (three dots). If you want to show more links you can create a landing page to use instead of the default page. In the demo below Peter Kalmstrom, CEO of kalmstrom.com Business Solutions and Microsoft certified SharePoint specialist and trainer, shows how to create a simple landing page with address and wiki links. You can of course make the landing page more appealing by using images, as described in our series of SharePoint Links tutorials. Here Peter only shows the principle of the landing page creation. These are the steps to create a links landing page in SharePoint 2013. Click on the settings icon and select Add a page. Give the page a name and click on Create. Write the text you want to link and link it via the Link button under the INSERT tab. You can add a link selected from SharePoint or copied from an address. The copied URL can be taken from anywhere. Write wiki-links. These links only works within a site, but they have some advantages over other links, please refer to the Tips article about wiki links. Replace the link in the Quick launch of the original page, so that it points to the new page instead. 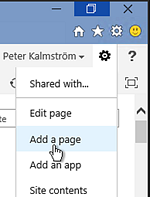 Also refer to the kalmstrom.com Blog post about SharePoint Landing page creation.